I called by Kenzo store near Bond street one day last weeks. Then … you know what the ending of this story is 🙂 This sweatshirt (and the one with tiger) has been seen very often during fashion weeks all around the world last month. But I still like it . It’s perfect piece for the fall days in London. Actually it’s not so cold here, i don’t mind the rain if it’s not freezing cold. as well as the color of the sweatshirt!! But the notebook is really cute too. Hm…yes everyone saw this sweater!but it’s amazing! oh my, i want this sweater so bad, it’s perfect! these items are just perfect! Ani słówka po polsku any more? Szkoda 🙁 Ale i tak kocham Twojego bloga. Zazdroszczę bluzy! Ma piękne, soczyste, wiosenne kolory 🙂 Idealna na pochmurne, szary dni, które panują teraz w Polsce. this is an amaziiiing sweater! 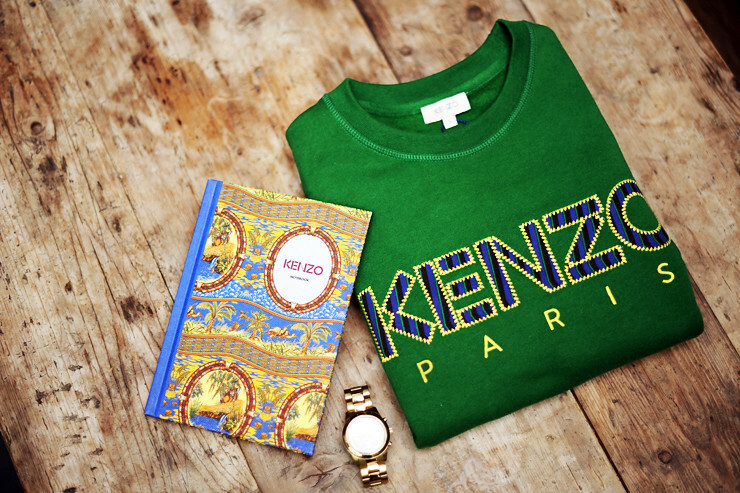 I wish I owned something Kenzo. I saw the other post in which you styled it. You look great!